For other uses, see Loxton, South Australia. Loxton is a town on the south bank of the River Murray in the Riverland region of South Australia. At the 2016 census, Loxton had a population of 4,568. It is a service town for the surrounding districts. The area near Loxton is a significant citrus fruit and summer fruit growing area. Loxton is also the main town for the northern part of the Murray Mallee which is a dryland farming and grain cropping area. Loxton has a pioneer settlement museum (known as the Loxton Historical Village), preserving the heritage of the mallee region. It is also famous for the "Loxton Lights Up" Christmas Festival in December each year, and the annual 120m Loxton Gift handicap sprint race held in late February. The town hosts the second round of the Australian HPV Super Series in May annually. Loxton is the seat of the local government area of the District Council of Loxton Waikerie. It is in the South Australian House of Assembly electoral district of Chaffey and the Australian House of Representatives division of Barker. The town is home to a variety of service clubs, most notably the Apex Club, Rotary Club and Lions Club. Loxton Clarion (and Murray lands Advocate) (2 July 1925–2 October 1928) - The Loxton Clarion's proprietor, Jack Irving, endeavoured to produce a publication reflecting the concerns of Loxton and surrounding districts. Its articles covered crops, care of livestock, vehicle maintenance, and local sport. From 23 July 1925, it was known as The Loxton Clarion and Murray Lands Guardian. In late 1928, it was absorbed into The Murray Pioneer and Australian River Record. Loxton Community Newsletter (June 1956–March 1960) - A monthly newspaper, published by The Loxton District War Memorial Community Centre, and incorporated into the Loxton News in 1960. Loxton News (28 April 1960–) - Irving came out of retirement to found a new newspaper. In 1964 it (like Irving's Clarion) was sold to the Murray Pioneer. The newspaper has gone on to win many Country Press SA awards. The first form of regular transport to Loxton was paddle steamers on the Murray River. The Loxton railway line was completed in 1914 connecting via Alawoona and Tailem Bend to Adelaide. Loxton today is connected by road to the Sturt Highway which passes nearby at Kingston-on-Murray and is the northern terminus of the Karoonda Highway and eastern terminus of the Stott Highway. The railway now terminates at the Tookayerta grain terminal a few kilometres out of town, but does not carry passengers, and is anticipated to close completely in 2015. Loxton is a town with many farms and fruit crops. The joint programme of salt interception schemes to help keep salt out of the River Murray, costing an estimated $60 million, commenced in 2001. This programme was expected to deliver 61 EC at Morgan by December 2007. The partner Governments of New South Wales, Victoria and South Australia and the Commonwealth have agreed that joint salt interception schemes must both be economically and technically feasible. The Loxton Gift athletics carnival offers the most prize money in South Australia apart from the Bay Sheffield held at Glenelg. The program includes races from 70m to 1000m and is the final major South Australian lead-up event to the Stawell Gift held at Easter. Since 2014, the streets of the town have been shut off in May for the running of the Loxton Pedal Prix, which is a round of the Australian HPV Super Series. The track incorporates the major central roundabout and the surrounding main streets. It includes two long 600m straights, one uphill and one downhill. The event has proved popular with locals, riders and spectators alike, and is now a mainstay on the Australian HPV Super Series calendar. In 2018 it will be round 2 of the series. Emily Beaton (b. 1987), Australian netballer with the Adelaide Thunderbirds, currently in the Australian Diamonds Netball Squad. Grant Schubert (b. 1980), Australian field hockey striker, 2004 Summer Olympics gold medalist and 2006 Commonwealth Games gold medalist. Grantley Fielke (b. 1962), former Australian rules footballer who played for West Adelaide in the SANFL and for both Collingwood and the Adelaide Crows in the VFL-AFL between 1979 and 1997. Magarey medallist in 1985. ^ a b c d "Search results for "Loxton, LOCB" with the following datasets selected - 'Suburbs and Localities', 'Counties', 'Hundreds', 'Local Government Areas', 'SA Government Regions' and 'Gazetteer'". Location SA Map Viewer. Government of South Australia. Retrieved 2 December 2018. ^ a b Australian Bureau of Statistics (27 June 2017). "Loxton (Urban Centre/Locality)". 2016 Census QuickStats. Retrieved 22 April 2014. ^ "Loxton, South Australia (Postcode)". postcodes-australia.com. Retrieved 20 January 2017. ^ "District of Chaffey Background Profile". ELECTORAL COMMISSION SA. Retrieved 31 March 2016. ^ "Federal electoral division of Barker, boundary gazetted 16 December 2011" (PDF). Australian Electoral Commission. Retrieved 31 March 2016. ^ a b c d "Loxton Research Centre Averages". Bureau of Meteorology. Retrieved 29 September 2016. ^ a b Laube, Anthony. "LibGuides: SA Newspapers: Riverland". guides.slsa.sa.gov.au. Retrieved 21 April 2018. ^ "Loxton Clarion". www.samemory.sa.gov.au. Retrieved 21 April 2018. ^ The Loxton clarion and Murray lands advocate [newspaper]. Loxton, S. Aust: The Loxton Clarion. 1925. ^ "Loxton community newsletter / The Loxton District War Memorial Community Centre Incorporated". Retrieved 21 April 2018. ^ "LOXTON RAILWAY". The Observer. Adelaide. 24 January 1914. p. 34. Retrieved 4 February 2015 – via National Library of Australia. ^ "Freight Study & Rail Operations Investigation" (PDF). Flywheel Advisory. Regional Development Australia – Murraylands and Riverland. 17 November 2014. p. 11. Retrieved 4 February 2015. ^ "St Peter's Evangelical Lutheran Church and Hall". South Australian Heritage Register. Department of Environment, Water and Natural Resources. Retrieved 28 May 2016. ^ "Loxton Institute, sometime District Council Office". South Australian Heritage Register. Department of Environment, Water and Natural Resources. Retrieved 28 May 2016. ^ "Dwelling ('Loxton Villa')". South Australian Heritage Register. Department of Environment, Water and Natural Resources. Retrieved 28 May 2016. 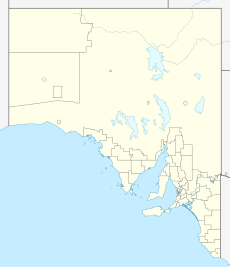 Wikimedia Commons has media related to Loxton, South Australia. This page was last edited on 11 February 2019, at 20:29 (UTC).